Yea ever since seeing our male chihuahua lift his leg anna has too, lol. Caninesrock- thats sad it had to be hard to watch her go. I had to put my dachshund down and the vet highly recomended i left the room, and I didn't really want to question him at the time and I just felt like I was abandoning him. Which felt horrible because he was dumped in one of our fields with our chihuahua in January. That is sad Canines. They are so wonderful. I was laughing when I read the first part because it reminded me of Buster so much. He never lifts his leg to pee. Never has. And he always rolls on his back like that too. It is hilarious when he does it in the mulch or in the pine chips from Athena's crate.They are such wonderful companions. Sorry it took so long to respond. I just saw this today. egroegart wrote: That is sad Canines. They are so wonderful. I was laughing when I read the first part because it reminded me of Buster so much. He never lifts his leg to pee. Never has. And he always rolls on his back like that too. It is hilarious when he does it in the mulch or in the pine chips from Athena's crate.They are such wonderful companions. Sorry it took so long to respond. I just saw this today. It was several years now so I've had some time to heal a little. Thank you though. Actually,the first part was about my male labrador. The boxer was a female that rolled on her back. They are so funny aren't they ? Here's some more pics from tonight of Athena. She loves to lay on the couch or blankets. Love the pics. The one of Athena sticking her tongue out is hilarious. I also love the one with her and Buster in pretty much the exact same position. She is just too cute sitting there with her legs tucked under her! I want to scoop her up and bring her home. I always enjoy seeing pictures of Athena. 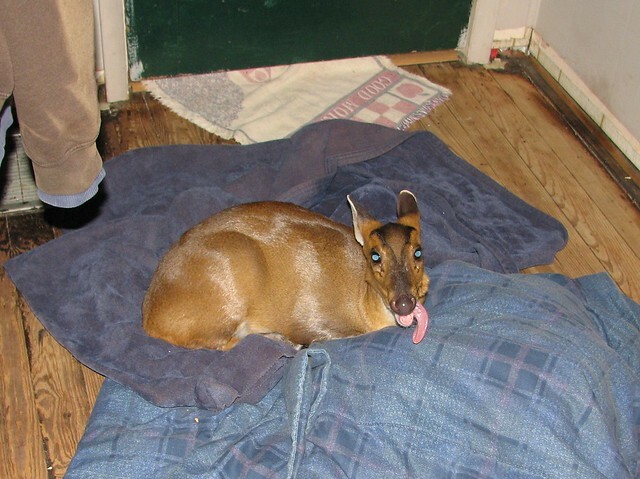 Muntjacs are really neat animals. Thank you guys. She is pretty awesome. We never thought she would be so affectionate. She is loving. Loves loves loves to be petted, non stop. 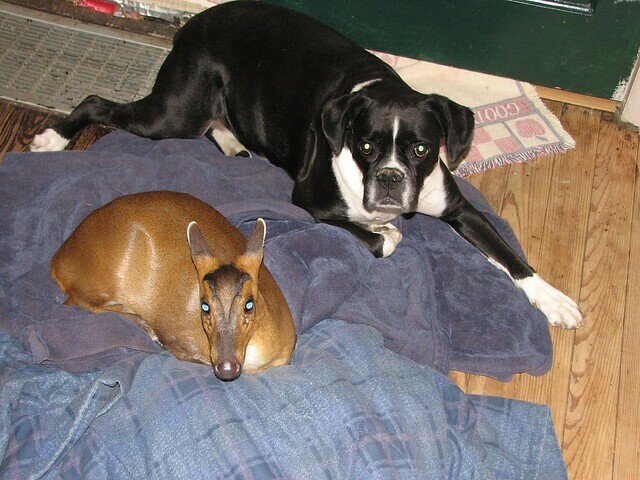 The breeders told us Muntjacs will never get on the furniture........................YAH RIGHT. lmao. She is up on the recliner and couches laying right next to us everyday. She runs and plays with the dogs and especially Benji all day. She loves that bobcat. They would both be lost without each other. She has to sleep in her crate at night because she chews everything, but as soon as we open her crate in the morning she runs around the house until she finds Benji and then they are off for their day of fun. It's so neat. Thank you, Athena is very well socialized. It takes her awhile to get used to new people when they come to our house, but as soon as they give her a carrot or scratch her neck she melts llike butter. Here's the latest video of her getting vacuumed. She absolutely loves to get swept. lol. 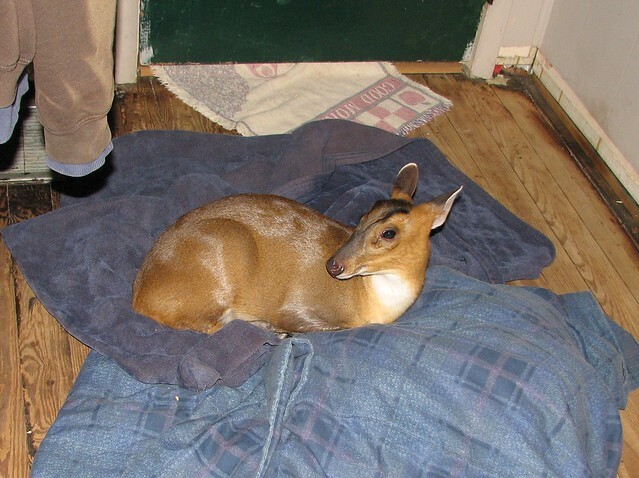 what a weird deer. That is so hilarious. I bet she is so much fun to have. Thank you. She is really fun to have around. Watching her function is exactly like watching a whitetail in the wild. The same mannerisms, movements, grazing, tail flutter.......But the funny thing to see is what she has picked up from our cats and dogs. She romps with the dogs and plays pretty hard with them, and to see that she plays alot like the dogs do. And then when she is with Benji she follows him around like she is copying what he is doing. She smells the things he smells, she lays down when he does. It's really interesting. She meets alot of people and is very social. She's a little shy at first when new people come over but she warms up very quickly, especially if our guests offer her a carrot. That must be hilarious to watch her play with the others, especially Benji. Such a unique pair they are. 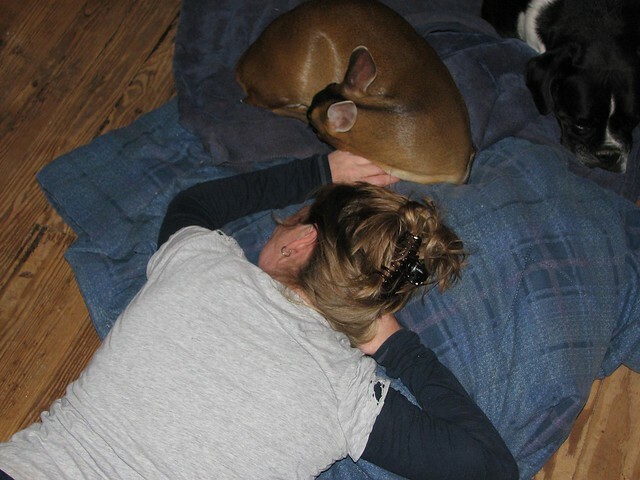 Seeing pictures and hearing stories about Athena has really made me interested in deer as pets. Maybe I'll be able to get one someday, many years in the future. They seem like a lot of fun. Thanks Unstable, they are so fun to watch. Athena is a lot of fun. You have to be watching her a lot when she is out and about in the house. She chews everything. But she makes up for it with her darned cuteness. lol. 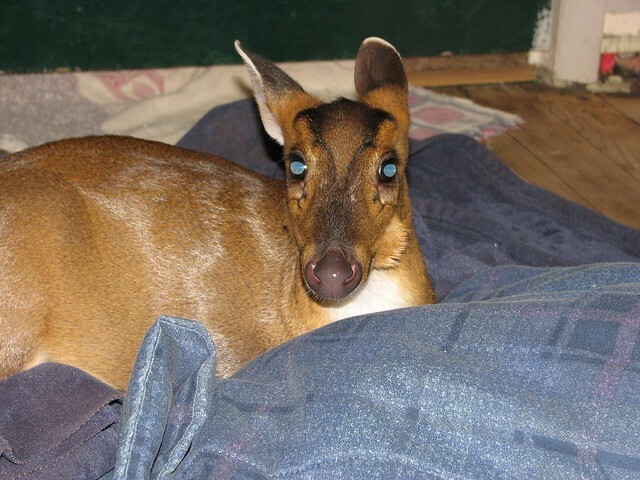 If you do decide to get a muntjac we know a really good breeder here in Ohio and one in Florida too. They are both wonderful with their babies. We can't believe that she likes to be vacuumed like that. We always figured she would be so skittish but she is really outgoing. Athena looks really shiny, glossy, and smooth. Is it just the photo or does her coat pretty much look that way in strong lighting? How does her coat feel?